So you asked, and here it is…What Craig Ballantyne Eats. At your request, I’ve put together my current daily diet. As you’ll see, I eat more fruits and vegetables in a day than the average American eats all week. And then some. It’s become a game to me…how many fruits and vegetables can I eat? Is there a new fruit or vegetable I can try and add to my diet? To be honest, I might be going overboard…but I enjoy it. And I certainly notice the lack of green vegetables when traveling and I fail to make adequate preparations. By the time I’ve been gone 2 days, I’m already looking forward to getting home and having a big greens-based blender drink. In my fridge, to the right, I have it filled with vegetables, eggs, and hummus on the top row, and cut up vegetables on the middle row, then almond milk and Garden of Life protein on the bottom row. 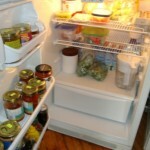 The crisper is filled with apples, and I have a store-full of salsa, spaghetti sauce, and nut butters in the door compartments. By eating more raw foods in your drinks and as salads, you’ll extend your lifespan and lower your bodyweight. And one strategy I recommend is to always be experimenting with new ingredients in your foods. I recently changed my blender drink methods, and you can read about those Nutrition Drinks changes here. I start my day with this Greens-based drink. Green Drink: Almond Milk (2 cups), Garden of Life Raw protein powder, spinach, ½ banana, blueberries (small amount, optional), cinnamon (needed for taste! ), cacao nibs, chia seeds, teaspoon of Spirulina powder, and a teaspoon of Athletic Greens powder. I also eat 2 oz of raw almonds and up to 6 raw dates at this time. Almond milk (2 cups), Prograde whey protein, raspberries or strawberries, and 1 banana (optional: pecans or peanut butter). NOTE: I don’t usually use whey protein, but a friend convinced me to try it again…and if you’re going to use Whey Protein, I recommend the company I’ve partnered with, Prograde. I also use the Prograde Essential Fatty Acid supplement at lunch…although I recently tried a similar product called “Flame-Out” from Biotest, and I might switch over to that one. 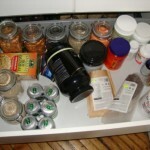 The only other supplement I use on a regular basis is Vitamin C.
By the way, this is a picture of one of my cupboard drawers…filled with almonds, cacao nibs, a couple of jugs of whey protein, Vitamin C pills, Spirulina, Athletic Greens, and a 6-pack of Heineken (for some strange reason). From Monday to Thursday, when I’m in Toronto, I have a large amount of vegetables with either black beans, kidney beans, or 4 organic eggs (yolks included). The vegetables include: spinach, red onion, broccoli, red pepper, and mushrooms. I also have 1/2 an avocado most days. Sometimes the vegetables are cooked, most days the vegetables are raw. On Fridays, I go to Freshii for lunch, and have a veggie burrito or two, and I get a bowl of chicken for Bally the Dog. 2:00pm – Raw nuts & dates OR apple plus 1 scoop of Prograde Protein in Almond milk. By the way, if this “multiple small meals” approach appeals to you, then you’ll like Isabel De Los Rios’ “Diet Solution Program“. If not, then you are better off with a more relaxed approach, like Brad Pilon’s “Eat Stop Eat” program. It’s unique, but TT members love it. On Mondays, I work about 12 hours in the day, and so I just relax at home at night, making this giant bowl of food at about 9pm while watching sports and “WW II in HD” on the History Channel. Tuesday Dinner (50% of the time at home, 50% of the time out) – If out, I have steak, vegetables (usually broccoli or asparagus), whole-wheat bread (if at a restaurant), and 1-2 glasses of red wine. If at home, I have ground beef, spinach, onions, and Amy’s organic chili all mixed together, plus 1 beer. On days when I eat meat at night, I tend to eat black beans or kidney beans at lunch. On days when I have grains at night, I have eggs at lunch. Wednesday Dinner – I’ve been trying alternative grains, including Barley and Millet. So I have the same giant bowl of grains plus vegetables (from Monday) if I’m just chilling at home. If I’m dragged out, then I’ll have a similar meal to Tuesday, but with a different meat (i.e. chicken or wild salmon). Thursday Dinner – Same as Tuesday. I’m out 80% of the time on Thursday nights for dinner. Friday Dinner – I’m usually traveling…80% of the time…so it’s a restaurant meal…and usually a big meal. One of my “cheat” meals, as they say. Cheat Meals – Currently I have 3-4 cheat meals each week. In the New Year, I’m going to try a full “Cheat Day”. I’ve never really done this before, using the Cheat Day style recommended by Joel Marion, John Romaniello, and others. We’ll see if it results in any differences. My current cheat meals include large meals at steakhouses, entire pizzas, or home-cooked meals at my Mom’s house with large desserts. Weekends – The schedule varies, but the food doesn’t change that much. If you want to see what I eat while I’m traveling, check out my free Fat Loss Travel Report here. You’ll also discover the Top 10 Rules for Losing Fat While On the Road. And as a guy who flew almost 25,000 miles this year, I know how to lose fat while traveling. It’s not really that hard. Even “in the middle of nowhere in Eastern Europe”. Download the free report and you’ll see.